Frequent overlooks on Heintooga Round-Bottom Road provide sweeping mountain vistas, and roadsides provide some of the best displays of summer wildflowers in the Smokies. 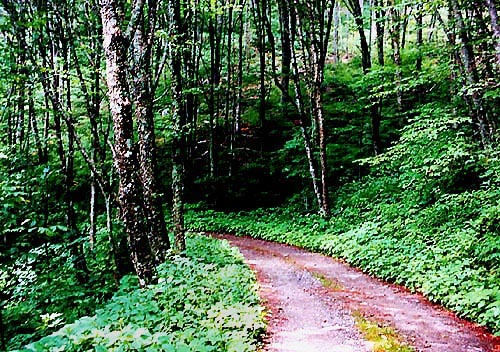 This beautiful driving trail descends from the high altitudes of the Balsams down into the coves of Roundbottom and Cherokee. The road is accessible from the Blue Ridge Parkway at the Cherokee entrance of the Park. Continue all the way up to the mountaintop. Make a left turn at the Balsam Mountain Campground sign and continue until the paved road dead ends just beyond the campground. This is a one-way road so once you start there is no turning back. The first fourteen miles are bumpy, winding, and sometimes steep. When you come out of the woods, it looks like the road dead ends into the water. Actually, you drive right through the water on a concrete ford. Park here, take your shoes off, and enjoy the cool mountain water! From this point it's a two way gravel road back to Cherokee. When you dead end into Big Cove Road take a left turn to go to Cherokee! To reach the Heintooga Ridge/Balsam Mountain area you must leave Great Smoky Mountains National Park briefly and drive the scenic Blue Ridge Parkway. The parkway begins midway between Oconaluftee Visitor Center and Cherokee, NC Exit the parkway near milepost 458 at the turnoff to Balsam Mountain Campground. You will follow the mile-high Heintooga Ridge Road for eight miles to Balsam Mountain Campground (5,310').